Contact us now for price , order and delivery service for your office or home. Our factory has a filtration system that produces high quality reverse osmosis water. We are also a supplier of other types of dispensing products such as direct piping line and alkaline filters. This free standing design — which combines a floor stand design and dispenser into one stylish home or office accessory — allows you to quickly dispense your choice of hot or cold drinking water whenever you feel thirst coming on. By having a supply of filtered drink at your fingertips, you can refresh yourself with hot or cold teas, coffee, and ice-cool beverages instantly, at any time of day. No searching for ice cubes, no opening the refrigerator or waiting for water to boil. 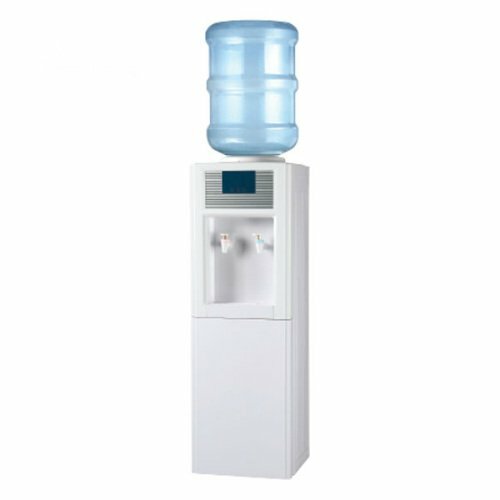 Your beverage is there waiting for you at your water dispenser stand — just bring your cup! Just place a 5-gallon water bottle onto this free standing water dispenser. That’s it! That’s 5 gallons of hot and cool water at your fingertips, every day, all day. Gravity fed means no complicated or noisy pumps to get the water into your cup, and no problems with dispensing that require you to call to frequently call technician in order to get access to your own water. Feel refreshed in your body AND in your wallet. This top loading water dispenser will save you a ton of money over buying filtered water from a store. Not only that, but you’ll save precious table top space, too! We will add new supply of water on a scheduled date. Stop crowding your kitchen pantry table or counter tops with unsightly old small bottles of store bought filtered water product . This electric water dispenser’s free standing design has a surprisingly small footprint, so you can stick it in a corner, out of the way, while preserving your table top or floor space.